You know they like mac and cheese. And you know they like anything with bacon, lettuce and tomato. 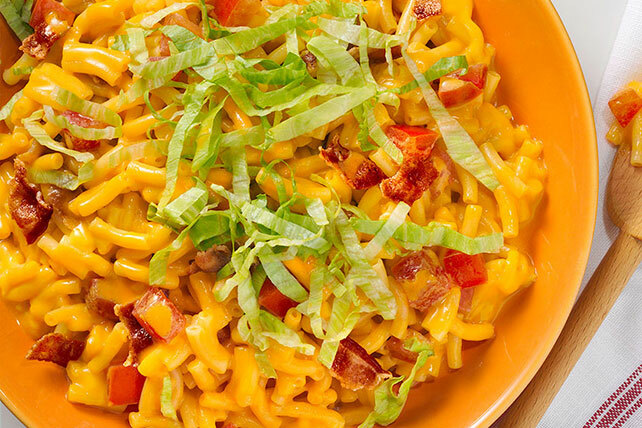 So this Mac Your Way: BLT Mac is a guaranteed win. Stir in bacon and tomatoes. Omit bacon, tomatoes and lettuce. Prepare Dinner as directed on package. Add 1/2 cup chopped green peppers, and 2 Tbsp. CLASSICO Traditional Pizza Sauce or tomato sauce. Top with 1/4 cup quartered OSCAR MAYER Pepperoni and 1/2 cup KRAFT Shredded Mozzarella Cheese. Omit bacon, tomatoes and lettuce. Prepare Dinner as directed on package. Stir in 1/4 cup BREAKSTONE'S or KNUDSEN Sour Cream, and 2 Tbsp. chopped pickled jalapeño nacho slices. Top with 2 sliced green onions and 1/4 cup crushed tortilla chips.